Truckloads of gear for "Disney's The Lion King" arrived yesterday. Luke Nye, advance carpenter, worked at getting a backstage curtain support ready for hanging. The traveling circus that is "Disney's The Lion King" set up shop at the Blaisdell Concert Hall yesterday, and a busy crew of Disney and Hawaii technicians swarmed over the shipping crates, erecting the complex stage. But when audiences are staring up at the artfully crafted staging of the gigantic production, they may not notice a longer-lasting change right under their feet. "It's been 20 years, and the old stuff was wearing out quick," said Blaisdell manager Sid Quintal. "When the mayor took office, we made an asset assessment and told him if Honolulu wanted to step up to the plate in the culture and arts business, we needed to upgrade our worn-out facilities." "Lion King" opens this weekend on the heels of show dates in Cleveland. The set pieces were packed immediately and put on two 747 cargo aircraft on Monday. The planes landed yesterday and work at the Blaisdell began soon after. 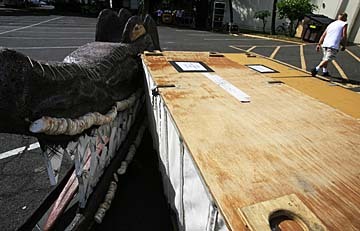 A large crocodile head used for the "Lion King" stage production sat waiting to be loaded into the Blaisdell Concert Hall yesterday. 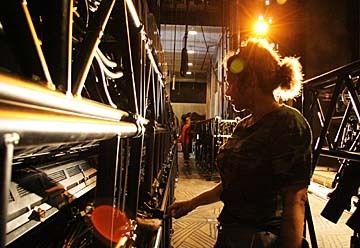 Production crew as well as local union workers began loading stage and lighting rigs yesterday in preparation for the show, which opens Saturday. The show's technical director, David Benken, estimated that more than 100,000 pounds of scenery and mechanics were transported. The new carpeting, some 600 yards of high-grade "enhanced back" industrial carpeting being installed by Society Painters and Floorcovering, cost the city between $170,000 and $180,000, estimated Quintal. Society carpet installers William Trujillo and Alberto Tadeo have been gluing down the new carpet for two weeks. "Kind of a big job," said Tadeo. "It's not just the landing areas, it includes the stairs and lobby." 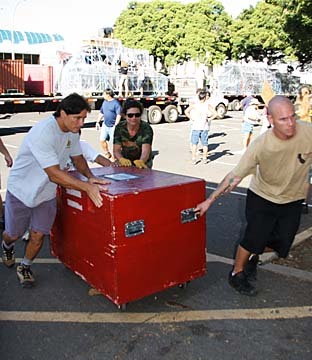 Technicians built momentum before pushing equipment up a Blaisdell Concert Hall backstage ramp yesterday, as truckloads of "Lion King" gear arrived. Ironically -- and that is the word used by Quintal -- the new carpet design mirrors the Keith Haring-style pattern used in the "Lion King" set. "Just lucky," said Quintal. "Or fate. It was chosen quite a while ago, and the pattern softens the spaces." It takes two to lay carpet, but it takes nearly 100 to erect "The Lion King." Al Omo of the International Alliance of Theatrical Stage Employees said 78 local technicians were already on the job, with the number rising to 94 by the end of the week, plus more than a dozen Disney techs. A technician dusted lights before they were hoisted. "It's a big setup," said Omo as he watched giant rolling boxes of gear shuttle in and out the stage entrance. "And very well-orchestrated. The last big show we handled like this was 'Miss Saigon' in 1999. And then, after the 9/11 attack in 2001, everything stopped. Nothing came out to Hawaii." Wait a minute. Yesterday was the sixth anniversary of 9/11. "Well, then," said Omo. "It's a blessing, isn't it?" For more on the effort it takes to bring "Lion King" to the stage, see HiLife in the Thursday afternoon and Friday morning editions of the Star-Bulletin. Technicians loop electrical cables through lighting grids at the Blaisdell Concert Hall in preparation for the Honolulu premiere this weekend of "Disney's The Lion King."